So I’m no Michael Hyatt, and I don’t blog every hour on the hour. If you don’t know who Michael Hyatt is, he’s like a crazy, mad daily blogger telling people that they need to be blogging several times a week to gain an audience and building a following and all that. He even has a ton of guest bloggers that blog for him. He is very good. And he has nice advice. I just can’t keep up with him! Yes, yes, I know. I’m lucky you are even reading this blog, aren’t I? You thought I stopped blogging altogether didn’t you? Well, I did. But I didn’t stop writing in the meantime. Last year was a wonderfully creative year spent on projects that helped boost my confidence as an artist. I started a fan page on Facebook. I wrote an optional script for a musical that was a bestseller for a publisher. I started a second book on an end-of-the-year, happy birthday to me writing retreat. I got to collaborate, edit and advise on scripts and books penned by fellow writers. I even took the leap and applied to a Creative Writing Masters program. I know more today that pursuing art and specifically writing is to become an increasing part of my life. I know this despite not being accepted into the Masters program (found out a few weeks ago). I know this even though I haven’t made a ton of progress on that second book I started in December (when I recently described the premise to a friend though, he got chills). I know that I need to write simply because of how it makes me feel. 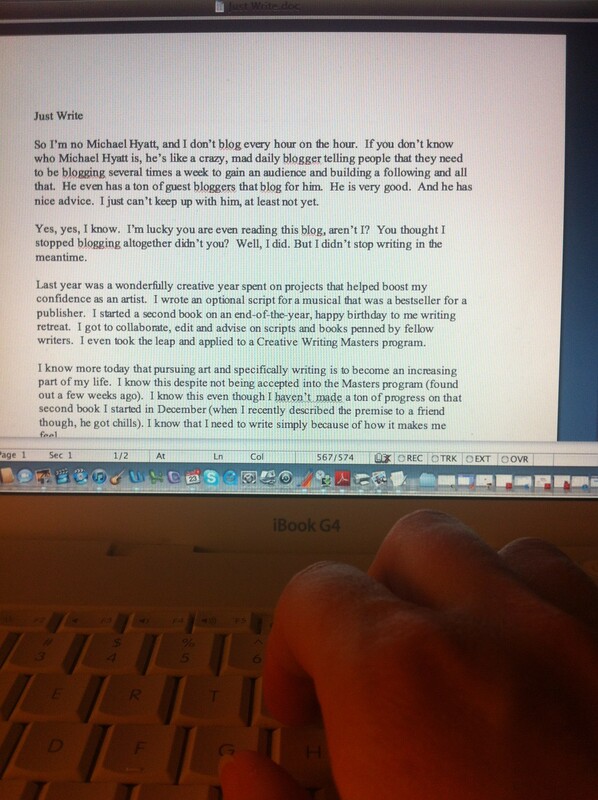 Tonight as I sit and work on this simple blog for instance, I feel so blessed and so much like myself. My body is so telling me to go bed, but I’ve discovered how valuable the process of writing is to my inner being, so I am writing in bed. Close enough. So what about this blog? Because the premise behind it has been about my time as a choir member, it has been difficult to write and post here on Notes from the Other Side of the Altar over the last few months. Much has changed at my church. Our music director is gone for complicated reasons; we have a new more modern worship service; and I’ve found myself more often than not having to let go of being in the choir on a regular basis. This season I’ve had to use many of the rehearsal hours I wanted to spend at choir for other things like making ends meet, keeping my house semi-clean, and being a mom. So, I am in the process of changing the focus of this particular blog. I appreciate your patience as I do so; insert “pardon my dust” sign here. As I struggle to work through life’s usual challenges and try to live up to my responsibilities, I sometimes feel the guilt of not really going for what I want. I know what to do, now if only I would do it, and on a more regular basis. It makes me wonder, what is keeping you from moving forward on the thing that you know you need to do? Is it the chatter from people, maybe even people who love you but don’t know how to encourage you? Is it a lack of knowledge? Is it a lack of resources? Is it really? Is it time, or not being disciplined enough to make time (my problem), to do what it is you need to do? Do you struggle with doubt? Do you let doubt win? If like me, you feel most like yourself whenever you do, even for a short while, the thing you know you need to do, then just do it! Start. Make the effort. Don’t think about results; live in the process of doing it. My mantra these days is, “just write.” And with that, I hope. I hope that by doing what I’m supposed to do, good will come of it. If nothing else, I will feel more “alive,” as a friend would say, when I am living out my calling. I encourage you to do the same. Don’t give up. Fill in your blank and just _______________.